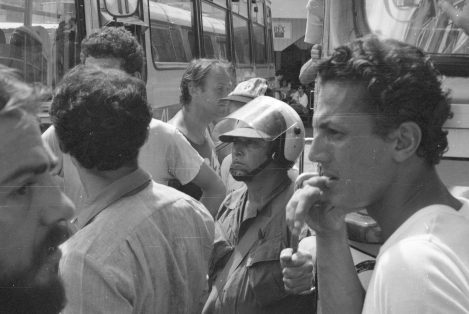 Panama's role as the originator of the Contadora process, which sought a Latin American solution to President Reagan's war against the people of Nicaragua, was in large part the heritage of Omar Torrijos Herrera, Panama's president from 1968 to 1981. Torrijos was a visonary who often mediated quarrels between various factions in his neighboring Latin American countries. He was also a genuine advocate for Panama's poor and middle classes, and Panama's elites hated him. Most of the historical information on Panama I present on this page comes from the book Confessions of an Economic Hit Man, (CEHM) by John Perkins. (Berrett-Koehler, San Francisco, 2004.) CEHM is a must-read for any well-meaning American in denial about the reasons why the U.S. government—not the people—is so hated around the world. A few words here to justify this bold statement are in order. Perkins lived with a guilty conscience almost from the moment he embarked upon his lucrative career as an economic hit man. He made several abortive efforts to tell his story, and finally decided to come clean after the events of 9/11. Perkins dedicates CEHM to Omar Torrijos and his fellow Latin American visionary, Ecuador's President Jaime Roldós. As Perkins tells it, he was recruited by an official of the National Security Agency (NSA), the most secretive branch of the U.S. clandestine services. After passing the NSA tests to be a spook, he was seduced by his own idealism into a stint with the Peace Corps. His NSA handler approved, adding the mysterious comment that Perkins "might end up working for a private company instead of the government." While in Ecuador, he was approached by a vice-president of one of America's most prestigious, and most low profile, engineering consulting companies: Chas. T. Main (MAIN). Even though Perkins held only a BS in Business Administration, the MAIN VP asked Perkins to send him a few write-ups on Ecuador's economic prospects. Perkins was "quite happy to comply with this request." The MAIN vice-president also confided to Perkins that he "sometimes acted as a NSA liason." No one told Perkins what his job really entailed, so he began educating himself to be an econometrician. One day, as he studied at the Boston Public Library, Claudine Martin, Special Consultant to Chas. T. Main, Inc. appeared. Attractive and smart, Claudine told Perkins that only she was authorized to inform him about the specifics of his job. Over the next few weeks they would secretly meet in Claudine's apartment while she told him what was expected of him. He would be an economic hit man, she said. First, Perkins would "justify huge international loans that would funnel money back to MAIN and other U.S. companies (such as Bechtel, Halliburton, Stone & Webster, and Brown & Root) through massive engineering and constuction contracts." Second, he "would work to bankrupt the countries that received those loans (after they had paid MAIN and the other U.S. contractors, of course) so that they would be forever beholden to their creditors, and so they would present easy targets when we needed favors, including military bases, UN votes, or access to oil and other natural resources." Perkins continues: "The unspoken aspect of every one of these projects was that they were intended to create large profits for the contractors, and to make a handful of wealthy and influential families in the receiving countries very happy, ... The larger the loan, the better. The fact that the debt burden placed on a country would deprive its poorest citizens of health, education, and other social services for decades to come was not taken into consideration." "We're a rare breed, in a dirty business," Claudine said. "No one can know about your involvement—not even your wife." Then Claudine explained to Perkins the genealogy of the EHM. The Vietnam debacle had shown that a new model for projecting U.S. power was needed—naked force no longer worked. 32 years before New York Times reporter Stephen Kinzer would write All The Shah's Men — An American Coup and the Roots of Middle East Terror, Claudine told Perkins how Theodore Roosevelt's grandson Kermit had orchestrated a CIA coup [code-named Operation Ajax] against the Iranian Prime Minister Mohammed Mossadegh in 1953. Mossadegh had nationalized the British-controlled Iranian oil fields in 1951, because of typical British exploitation, arrogance, and broken promises. He was virtually worshipped by the vast majority of the Iranian people. But U.S.-sponsored coups can be exposed, and a better solution had been worked out: "U.S. intelligence agencies—including the NSA—would identify prospective EHMs, who could then be hired by international corporations. ... their dirty work, if exposed, would be chalked up to corporate greed rather than to government policy. ... the corporations ... would be insulated from congressional oversight and public scrutiny, shielded by a growing body of legal initiatives ..." "So you see," Claudine said, "we are just the next generation in a proud tradition that began when you were in the first grade." Perkins "graduated" just before leaving for Indonesia on his first assignment. Claudine congratulated him with a toast: "You made it. You're now one of us." Then she warned him: "Never admit to anyone about our meetings. ... Talking about us would make life dangerous for you." 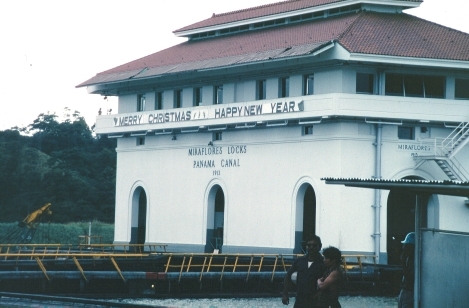 After returning from Indonesia, Perkins passed his second test. He produced an inflated economic forecast that MAIN wanted to present to the international lending outfits. He was promoted, and his colleague, a professional of long experience whose numbers were half those Perkins predicted, was fired. Perkins sought Claudine, both to tell her the good news of his promotion, and to share some disturbing experiences in Indonesia. One of those experiences was an ominous prediction from some Indonesian Muslims to whom Perkins had been introduced. 30 years later, on September 11, 2001, the prediction was fulfilled. "It is not farfetched to draw a line from Operation Ajax through the Shah�s repressive regime and the Islamic Revolution to the fireballs that engulfed the World Trade Center in New York," wrote Stephen Kinzer in All the Shah's Men. The mysterious Claudine had vanished without a trace. More from Perkins below. La Marcha co-leader Blase Bonpane arrives with other U.S. marchistas. 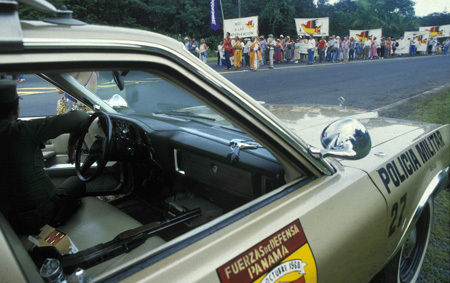 La Marcha had the official endorsement of the Panamanian government, then under the control of General Manuel Noriega. I'm not sure where exactly we are here. My notes indicate Panama's state-owned power facility, the Instituto de Recursos Hidraulicos y Electrificación. If so, we are at the same location where John Perkins, above, met General Omar Torrijos in 1972, and set up the business arrangements for Panama's "modernization." More on this below. Several country groups had already been here for a couple of days. The Danes, lusty descendents of the Vikings that they are, knew how to party, and stayed up very late singing and playing guitars. Danish photo-journalist Sonja Iskov, back left, in profile, converses with another marchista. The Danes and I became good friends. 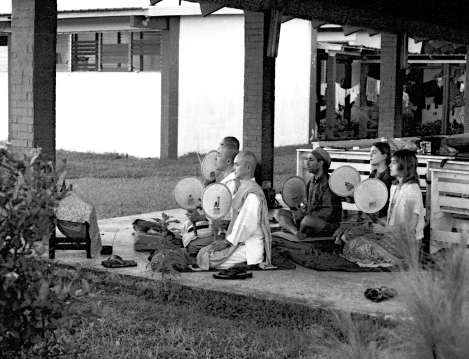 Greeting the sun was a daily ritual for Buddhist Reverends Momoru Kato, Hideki Sasamori, and Katsuzo Sawada. (Names not likely in the order in which they are seated.) 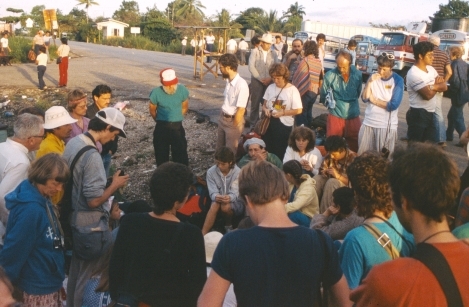 Here, on my first morning in Panama, they are joined by Marshall, an unidentified woman (Holly?, Brenda? Pat? ), and Barbara. On this morning there was also a strong protest raised by many of those who had just arrived after a long flight, and who would rather have had a good night's sleep than serenades. The discussion that ensued was the first of many that invariably increased our mutual respect and caring for each other. As I recall it, la marcha governance was an exercise in creative frustration. At first, we tried a three-tiered decision-making structure: a steering committee at the top would interact with the various national and local governments, learn from them what the possibilities and exigencies were (security, transportation,...) come up with a plan, and present it to the next group down, comprised of a representative or two from each of the national groups. These reps would then pass along the plans or suggestions to the respective national groups, wherein the final decision-making power was intended to reside. Each national group would discuss the plan submitted, vote yea or nay, or, more likely, suggest alternatives. The mid-level national reps would then take this new information back to the steering committee, which would mull it over. Then, the steering committee would usually decide that we marchers would do whatever the national or local governments said we could do. This of course did not set well with the serious democracts among us. So, we then settled on the tried-and-true approach used by the ancient Greeks: direct democracy of the whole. No national reps, and the steering committee would be nothing more than a conduit for information and for our decisions. The improvement was immediate and dramatic; after long and serious discussion of an important issue, we would vote unanimously to do whatever the national and local governments said we could do. We always enjoyed the discussions, though. Tuesday, December 10, late afternoon. 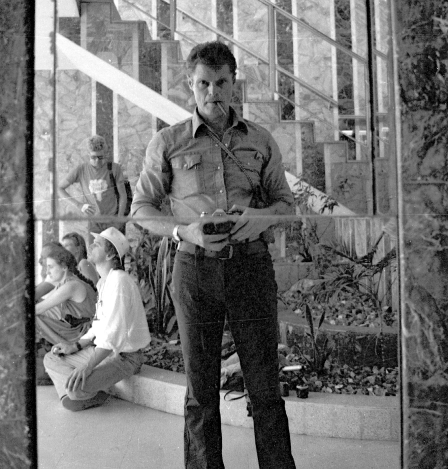 Self-portrait. I'm certain we are in the entrance of the National Lottery Building, the site of government headquarters. Here we will officially announce la marcha. Sitting behind me in the hat is Gary, from my own home neighborhood in Los Angeles's San Fernando Valley. Sitting farthest from me is Nikki, with her husband Bruce standing by her. They are from San Diego, and the year before had backpacked through parts of the Guatemalan forest where the hemisphere's longest-running, shooting revolution was still in progress. Whoa!! 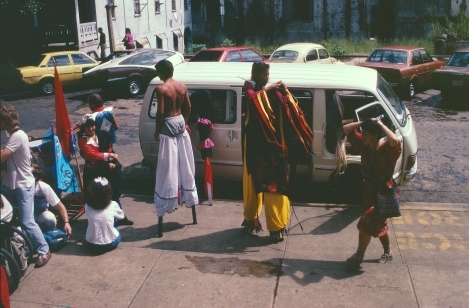 In 1961, descendants of the Mayans decided that the only solution to their brutal exploitation by Guatemala's economically and politically dominant Spanish-Indian "Ladino" population was armed struggle. 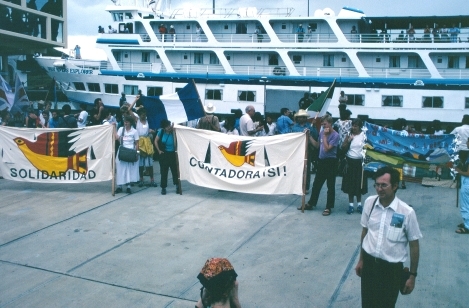 The response of the Ladinos was extraordinarily brutal, and well after the march was over, Guatemala continued to enjoy a reputation as the worst human rights violator in the hemisphere. It's official. 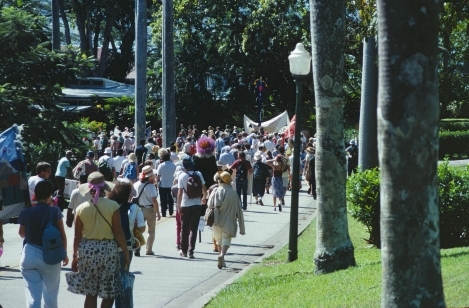 La Marcha Por La Paz En Centroamerica begins on the 37th anniversary of the Universal Declaration of Human Rights. 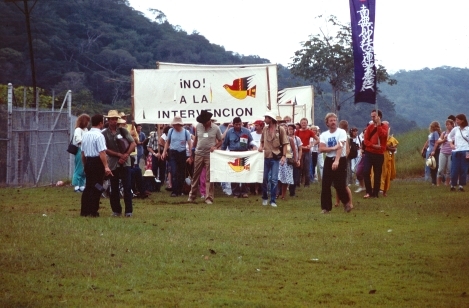 La Marcha was welcomed by Omar Torrijos's good friend, the British author Graham Greene, and by Panama's senior spokesman, Jorge Illueca, who predicted "The March of these messengers of peace will light a flame of hope in the region and will contribute to creating a climate to stimulate and revitalize the Contadora negotiations." 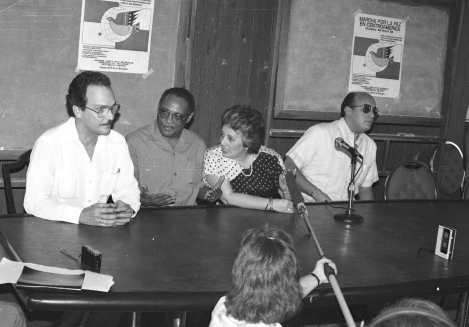 Here march organizer and leader Torrill Eide holds the microphone for Blase Bonpane as he explains the goals and methods of the March for Peace to the press. 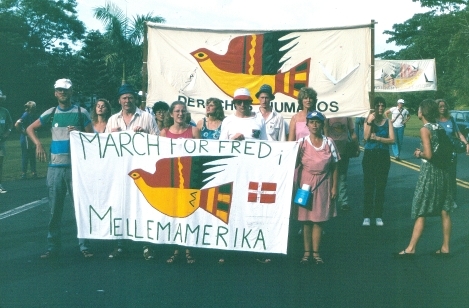 To Torrill's left is la marcha's press secretary, Ron Ridenour, an American journalist living in Denmark and traveling with the Danes. Ron was instrumental in arranging for our food and transportation, as well as in organizing local committees in Mexico, Costa Rica, El Salvador, Nicaragua and Panama. He also arranged for our media contacts in these countries so la marcha would be assured of coverage, at least in Central America. My notes show a Dirk Drijbons of Belgium, representing the International Union of Socialist Youth, also on the dais. That may be the man to Blase's right. The woman in the march t-shirt is probably a marchista acting as translator. 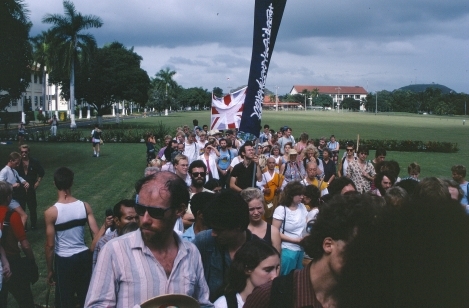 At a rally held after the press conference, a statement in support of the march by African Anglican bishop and 1984 Nobel Peace Prize winner Desmond Tutu was read by the Secretary of the Associaton of Black Panamanians. A statement of support by Swedish Prime Minister Olaf Palme was read. Palme was a Social Democrat, a serious socialist, and had opposed both the Vietnam war and the Soviet Union's invasion of Czechoslovakia. He was assassinated in Sweden 35 days after the conclusion of la marcha. Palme's assassin was never apprehended. Other publicity: March leader Peter Holding explained our goals on the radio program of a builder's union that strongly supported la marcha. Peter also recalls one of our early discussions on freedom of the press: "I remember the debate on the role of journalists who were members of the March. Should they have unrestricted access to information if they were not prepared to self-censor or be accountable to the march as a whole? This issue was never really resolved." My notes indicate that these Panamanian supporters of the march are leaders of Panama's Social Democrats. Beita Torillos greeted us warmly: "The march you will do encourages us to continue our struggle for peace." The man to her left said "we think it is significant. We hope your effort will help Contadora." A Google search of the Internet based on my notes convinces me that Rómulo Escobar Bethancourt, Panama's principal negotiator for Panamanian control of the canal, and Panama's best known statesman, also gave us his support: "The march will have a great effect on Central America. It will show that many people in the world do not want war. We are proud you are here. If Omar torrijos were here he would go on the march with you." I do not know which of these men is Bethancourt, however. This is not Pulitzer Prize-winning journalism. I ask any visitors to this site who can positively identify any of the people in this photo to please contact me. This headline in the Panama Star was typical of the treatment given to la marcha by Panama's overwhelmingly right-wing press. In part, this article tells the reader that the Panama Star "knows of" a document prepared about the March, and "sent to leftist movements in Central America and Panama." "The document," says the Star, "includes an organization chart headed by the Communist Party of the Soviet Union, followed by more than 30 important organizations," among them the Communist Parties of the United States and East Germany; the Soviet news agencies TASS and Novosti; the KGB [Soviet secret police]; and "others, directly or indirectly controlled [by] or under the influence of the Central Committee through directorates, affiliates, and union programs." 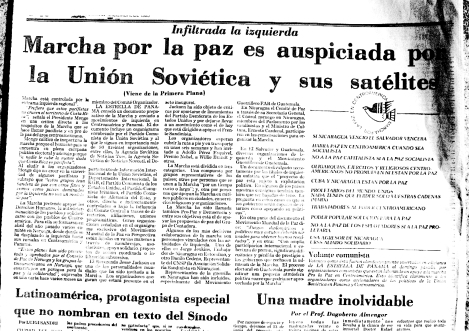 To the right of the article, the Star shows a "communist flyer," headed by the march logo, it says was inserted clandestinely into a Sunday edition "by communist organizations that are working on behalf of the March for Peace in Central America." Among other leftist slogans below the march logo, the flyer includes Karl Marx's famous dictum that the proletariat has nothing to lose but its chains, and the assertion-threat that "there will be peace in Central America when it becames socialist." Well now, who could doubt that this "clearly identif[ies] the organizers and organizations as political agents of the Soviet Union in Panama and Central America." Certainly not The Panama Star. I personally consider it a virtual certainty that these documents did exist; that they were created by, or under the guidance of, the CIA; and that the Panama Star was well aware of the hoax, if not directly involved. The "communist flyer" may well have been inserted into the Sunday edition by CIA agents with some extra time on their hands. These guys were probably bored out of their skulls, and it makes perfect sense that they would want to have a little fun with a bunch of activists who were questioning the ethics of their livelihood. But, whoever produced this comically obtuse propaganda effort, LA ESTRELLA PANAMA carefully avoided saying that the documents were produced or distributed by la marcha. 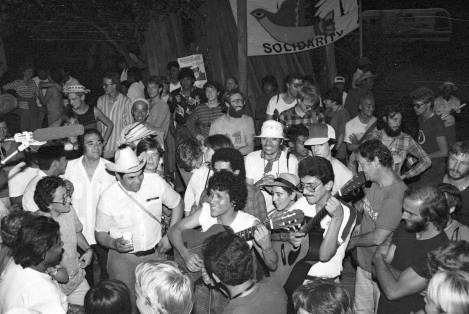 The documentary of la marcha, Viva La Paz, corroborates my recollection that over the course of our short stay in Panama, the press turned around and gave its full support to the march. Perhaps this early march-bashing was a sop thrown to the Reagan administration. 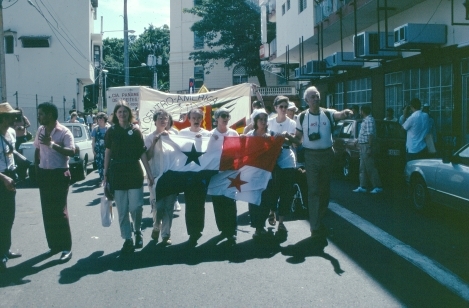 Our first real march was a retracing of the steps taken in 1964 by a group of Panamanian students, whose goal was to raise the flag of Panama over the Canal Zone. U.S. troops fired on the students, killing twenty-four. This brutal response of the U.S. hegemon led Panama's President Chiari to break relations with the U.S., and thus began a serious movement toward transfer of the canal to Panama. 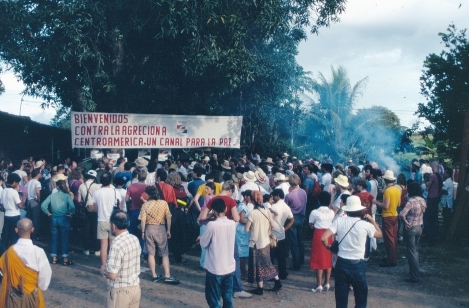 U.S. President Jimmy Carter and Panama's then-president Omar Torrijos Herrera negotiated a treaty by which the canal would revert to Panama on December 31, 1999. We were joined for the day by Teatro Oveja Negra, the "Black Sheep" Theater troupe. As we marched through the well-manicured landscape of Quarry Heights, the site of the U.S. Southern Command, we made sure that passing motorists noticed us. The Southern Command was the headquarters of the U.S. military presence in Latin America, and a perennial affront to Panama's sovereignty. This was the site of the hated School of the Americas, where Latin American officers, usually from upper-middle class or wealthy families, were trained in all the latest methods for the repression of dissent in their respective nations. 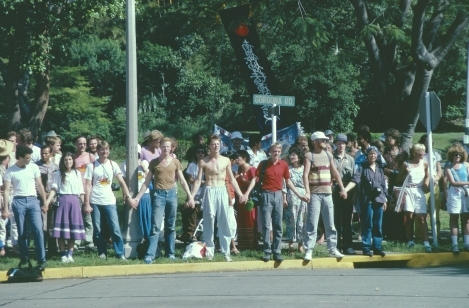 Nothing was more important to the U.S. business community than stablilty south of the border, and Latin American leftists, with their pesky demands for better wages and working conditions, to say nothing of their demand for their governments' observance of the U.N. Universal Declaration on Human Rights, could be counted on to try to exploit the unrest that seethed beneath the surface of Latin American culture. Kind of like parts of Beverly Hills. 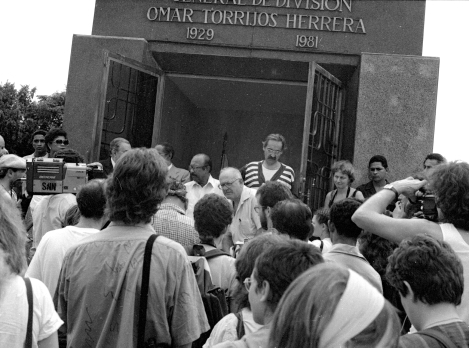 We have arrived at Omar Torrijos Herrera's tomb, where we will pay our respects to the man who stood up to the United States, as well as being a pretty decent President. John Perkins was sent by MAIN to Panama in 1972, following his successful tour of Indonesia. (See top of page.) The following information on Torrijos, and quoted material below, is from CEHM. 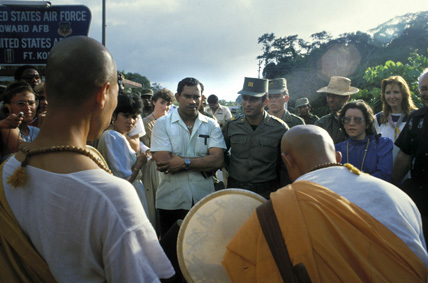 Torrijos was an officer in the Panamanian National Guard, and came to power in 1968 through a coup which deposed Panama's current dictator, Arnulfo Arias. Torrijos himself was "highly regarded by the Panamanian middle and lower classes," because as a National Guard officer, he had "earned a reputation for listening to the dispossessed, ... held meetings in slums politicians didn't dare to enter, helped the unemployed find jobs, and often donated his own limited financial resources to families stricken by illness or tragedy." Upon arriving in Panama, Perkins noted a prominent billboard featuring Torrijos's portrait over the defiant caption "Omar's ideal is freedom; the missile is not invented that can kill an ideal." It appears as if Arnie, from Sweden, is preparing to take a picture of this poster showing Omar Torrijos at the canal's Miraflores Locks, our next destination. 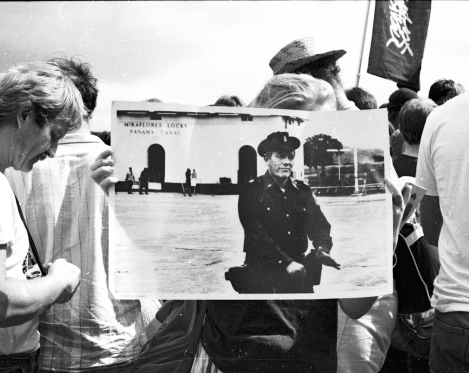 Looking at this photograph now, I am certain that the Danish woman holding the poster—Tina, I think—quickly brought it up in front of her face just so I could not take her picture. I outsmarted her though—she is the lovely young woman in the photo immediately above, center. I think she married a U.S. marchista later in 1986. While he was poring over some statistics at his office at the Instituto de Recursos Hidraulicos y Electrificación, Perkins was summoned to a meeting with Omar Torrijos himself. Torrijos proved to be an astute observer of U.S. foreign policy. He discussed the overthrow of Iran's Mossadegh in 1953, and the CIA-led overthrow of Guatemala's democratically elected, reform President Jacobo Arbenz the following year. "Arbenz was assassinated," Torrijos told Perkins. "Political and character assassination. How could your people swallow that CIA rubbish? I won't go so easily. The military here are my people. Political assassination won't do. The CIA itself will have to kill me!" Torrijos was referring to the enmity he had earned in Washington and Wall Street. He was openly exploring the possibility of constructing a new, sea level canal, with possible financing and construction by the Japanese. This would cut out the Bechtel Corporation, which was "loaded with Nixon, Ford, and Bush cronies," according to Torrijos. [George H.W. Bush also owned United Fruit, on whose behalf the 1954 coup against Arbenz was launched.] "I've been told that the Bechtel family pulls the strings of the Republican Party," Torrijos added. But Torrijos also wanted Panama to be a model: "We must show that we care about our poor and we must demonstrate beyond any doubt that our determination to win our independence is not dictated by Russia, China, or Cuba. We must prove to the world that Panama is a reasonable country, that we stand not against the United states, but for the rights of the poor." To that end, Torrijos was willing to deal with MAIN. "I understand that your company wants more work and usually gets it by inflating the size of projects. ... This time is different, though. Give me what's best for my people, and I'll give you all the work you want." Perkins agreed: "By the time I left him we both understood that MAIN would get the contract for the master plan, and that I would see to it that we did Torrijos's bidding." 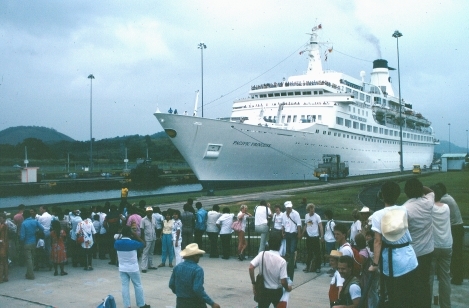 By the time Perkins returned to Panama in 1975, Torrijos had "launched an all-out political battle" for return of the Panama Canal. 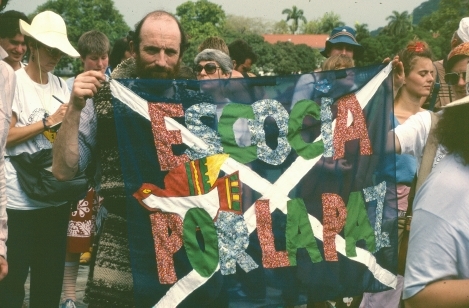 Perkins wrote an Op-Ed for the Boston Globe: "Colonialism in Panama has no place in 1975." The op-ed inspired a MAIN project manager to send Perkins a note with a skull and crossbones over the question "Is this Commie really a partner in our firm?" Back in Panama in 1977, Perkins met Graham Greene, who said that he feared for Torrijos's safety. In spite of his friendship with Torrijos, Greene had written an article exposing corruption in the National Guard. Torrijos admitted to Perkins that he gave his staff special privileges: "If I don't pay them, the CIA will." Perkins wondered if the "jackals," his term for CIA-paid hit men, had begun to circle. Then there was Torrijos's successful negotiation with President Jimmy Carter for return of the canal to Panama on December 31, 1999. The canal treaty also required the closing of the School of the Americas and the tropical warfare center. "Conservatives swore revenge," writes Perkins. Torrijos was not the only nationalist reformer in Latin America working within the capitalist framework. 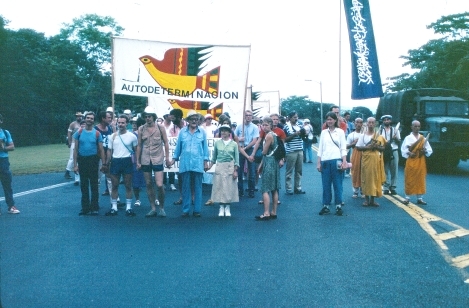 In 1979 Jaime Roldós was elected President of Ecuador, largely on the platform of ensuring that Ecuador's oil resources would be used to benefit the people of Ecuador. Like Torrijos, Roldós was not against the U.S., but for his people. His adversary was Texaco. At the beginning of 1980, Perkins resolved to try to be more like Torrijos and Roldós. In April, he quit MAIN. 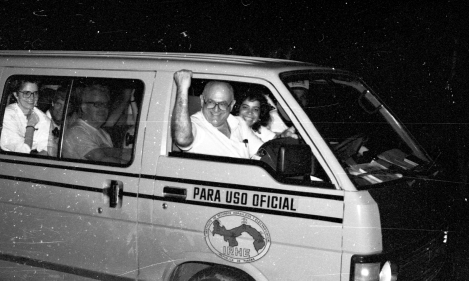 Torrijos and Roldós were anathema to U.S. interests, and with the election of President Ronald Reagan, the outcome could not have been in doubt. On May 24, 1981, Jaime Roldós died in a helicopter crash in southern Ecuador. In eulogizing Roldós, Torrijos confessed a nightmare: "He saw himself dropping out of the sky in a gigantic fireball." On July 31, 65 days after Roldós died, Torrijos also died when his twin-engine Otter crashed. A few days later, his friend Graham Greene received a phone call from Torrijos's security guard, who said that a bomb had been placed in the plane. 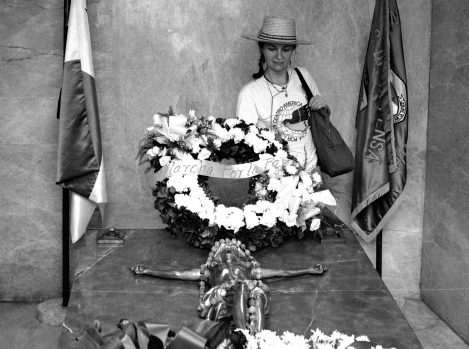 We laid a wreath on Torrijos's crypt. Dianne from Cananda looks on. The man who soon replaced Torrijos as Panama's head of state was National Guard officer Manuel Noriega. Noriega was a thoroughly corrupt character, who had been on the CIA payroll for years. (Some speculate that the CIA used Noriega to assassinate Torrijos.) 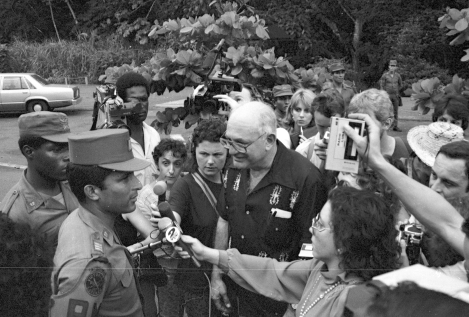 With a wink and a nod from the CIA, Noriega became a proficient gun-runner and drug smuggler. But, Noriega was also a nationalist who would not abrogate the terms of the canal treaty. He refused a 15-year extension for the School of the Americas (from which both he and Torrijos had graduated), and, worst of all, he continued to explore the idea of a Japanese-financed and constructed sea-level canal. Perkins: "The Arias family and the pre-Torrijos oligarchy, which had served as U.S. puppets from the time when Panama torn from Colombia ... were reinstalled. The new Canal Treaty became a moot point. In essence, Washington once again controlled the waterway, despite anything the official documents said." Ships rise and drop 85 feet as they pass through the 50-mile-long canal, 54 of those feet here at Miraflores. We knew there would be a couple of ships coming through, and how could we resist the lure of such captive audiences? One of the two Love Boats. I'm pretty sure that the large banners were made by the Norwegian contingent. Canada and Central America for Friendship, Peace, and Liberty. Pretty subversive. Note the scary-looking women holding the banner. 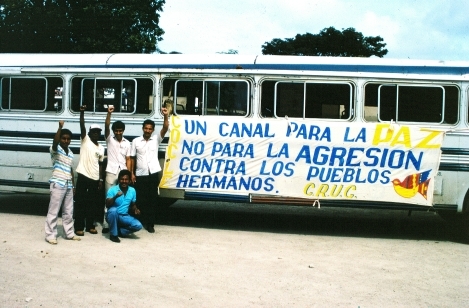 A canal for peace, not for aggression against the people. Our bus drivers were enthusiastic supporters of la marcha. Paul Baker, from Scotland, and his sister made this lovely banner. 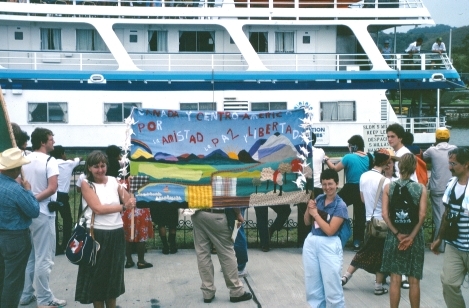 It now hangs in Paul's office in Managua, where he is the Nicaragua coordinator for The Nicaragua Network, a Nicaragua solidarity outfit founded in 1979. 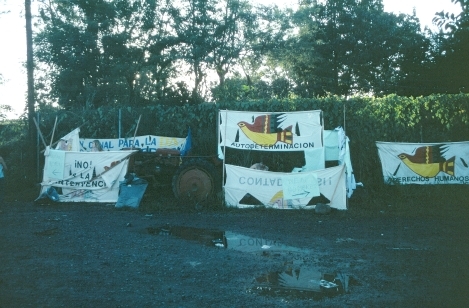 The banner saw action again not long ago in a rally opposing water privatization in Nicaragua. Paul is also a musician whose music speaks for the dispossessed, the exploited, the disappeared, ... Learn more about Paul's ongoing comittment to peace and economic justice at Echoes of Silence. We prepare for our march to Howard Air Force Base, the 800-lb guerrilla of all military installations in Latin America. Howard was where the Nicaraguan contras were trained, and the embarcation point for weapons deliveries to the U.S. client states in the hemisphere. Arnie from Sweden on the right, Ron Ridenour in the hat on the left. My notes show that by this time we had developed a structure, and guidelines, for our actual marching. Two "generals," a man and a woman. (Arnie above is a "general.") The generals will postion themselves at the front and the rear of the marchers, each wearing a white cloth "X" for identification. Ten percent of each national group will be "peacekeepers." They will never travel alone, and will be unprovocable and undistractable. They will look out for drug plants, right-wing agents provocateurs. Monitors will walk alongside the march, and wear white armbands. We will march in pairs, 3s, or 4s, and direct the press to march spokespersons. 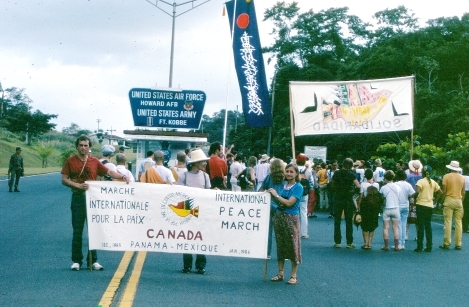 Canadians Susie, Jerry in the middle, and a compatriot display the Canadian banner in front of the Howard AFB gate. Not visible here is the admonition in the kiosk window "Elite Entry". We were pretty sure that we would not be considered "elite," but we decided nonetheless that each of us, individually, would request entry to the base, so we could snoop around and maybe persuade some of the base personnel to join us. The Panamanian officer in charge was a good sport about it all, but regrettably had to deny our requests for entry. The Panamanian Defense Force is ready for us. The Vikings. The woman in the green dress to the right of the front line is a "general." More yanks. Bruce, a quadriplegic from Berkeley, California, emerged as one of the U.S. contingent's wisest counselors. 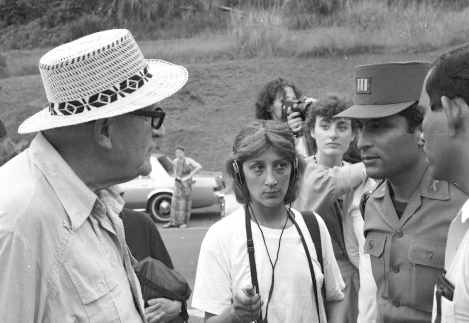 Australia's Penny O'Donnell (in the dark shirt) holds the mike as Blase Bonpane tries to convince the Panamanian officer in charge that la marcha poses no threat to the Howard Base. No luck. 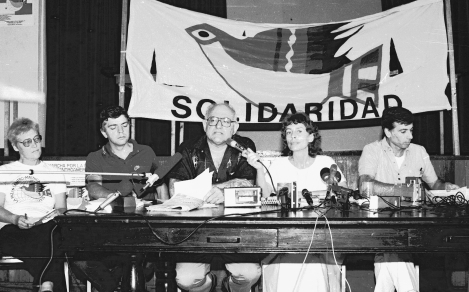 Penny returned to Nicaragua after the march and worked with the Sandinista popular communication project. 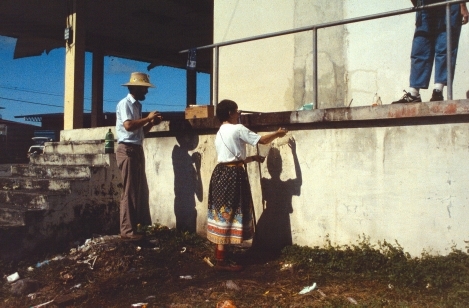 Her master's thesis (Universidad Iberoamericana) Teaching and learning communication in Nicaragua during the Sandinista Popular Revolution was published as a book in 1993. 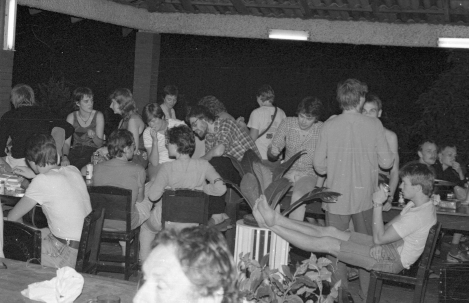 Penny also wrote a book about her experiences in Nicaragua: Death, dreams and dancing in Nicaragua, Sydney, 1991. ABC Books. The Buddhist monks fared no better. Film-maker Kelly Holland, who will document la marcha in Viva La Paz, stands back right. Even Ollie was refused entry. How could anyone see this elderly gentleman as a threat? I hope that the Spanish marchista looking askance at the officer is mentally rehearsing some choice phrases—en Español—not for the officer, who had no choice, but for the U.S. government. Perhaps if the Greenham Commons women had not asked about nuclear weapons we might have been allowed in. After our failed effort to inspect Howard AFB, it was time to move on toward Costa Rica. 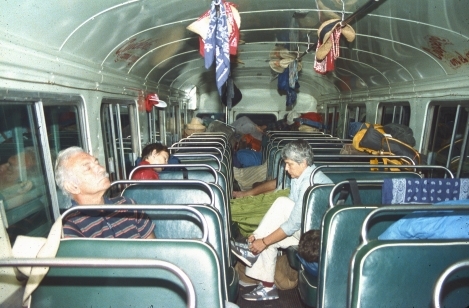 La Marcha left Panama City at 6 a.m. for a 300-mile bus ride to the border. The first 93 miles took three hours. Later, not far from the border in Panama's northern state of Chiriquí, we are treated to a barbecue by members of a supportive cooperative. We have learned that Costa Rica's reputation as the "Switzerland of Central America" has been grossly overstated. The government of Alberto Monge does not want us there. The right-wing, quasi-paramilitary outfit Costa Rica Libre (CRL), founded by none other than Costa Rica's own Minister of Security, Benjamin Piza, is planning to attack the march. Because Costa Rica is in the midst of a national election campaign, the government cannot protect us from them. Monge himself fans the flames of hate by referring to the march as an action of the extreme left. As we drove northward, march leaders Blase Bonpane, Torrill Eide, and Daniel Moore flew to San José to negotiate our entry into Costa Rica. After the barbecue, we celebrate our hosts' generosity and solidarity until dark, "to the astonishment of the farmers," as Mel Fiske put it in his December 30 report on the march. California farm worker Francisco stands left of the guitarist, who looks to me to be one of our local supporters. A couple of Spanish marchistas whose names I don't have are close by. Barbara looks directly at the camera above the mike on the left. More on Barbara later. Well after dark, we finally leave the cooperative without being sure where we will spend the night. Next morning. We awaken at our new digs: a customs holding warehouse in the neutral buffer area between the two borders. Immediately after taking this photo, I filled my own canteen with the same water—for drinking. I was diligent about using my iodine purification tablets, and through the entire 45-day trip, I suffered only one night of mild stomach upset, in Nicaragua. Others were not so lucky. Mel Fiske become very ill from a bug he believes he picked up here, and had to return home after only 16 days with the march. Not only Norteamericanos suffered from bad water. Several of our Costa Rican supporters who later followed us into Nicaragua became seriously ill there also. When we were not marching, banners doubled as privacy curtains for our portable outhouses. 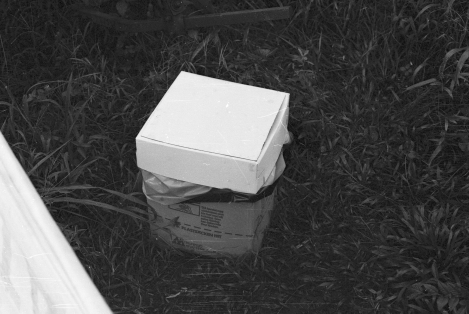 For the really curious: your basic heavy cardboard, plastic lined, deluxe model porta-potty, with lid. The cardboard box was reused, of course, and for obvious reasons we treated them very gently. Early on, many of our more fastidious marchistas were afraid that they would catch some virulent Central American bug if they sat directly down on the (usually) cement toilet seats of the roughly-fashioned privys we sometimes had to use. So, they stood on the seat instead, and, relying on a less-than-unerring aim made worse by the somewhat explosive gastrointestinal conditions many of us suffered, quickly made a real mess of things. Needless to say, there was a rush to be first to the privy in the morning. To a practical Yankee from California, this was unacceptable, so I took it upon myself to assure the marchers, firmly but respectfully, that we were in more danger from this literally misguided effort to protect our health than if we simply gave the toilet seats a good scrubbing first thing in the morning, and then just sat right down on them. I don't recall whether my advice was taken. 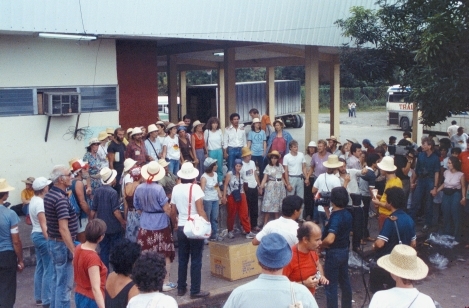 Later, at one location in Nicargua, our sheer numbers caused serious overload of the toilet facilities, leading me to suggest a strictly monitored, timed line-up for toilet useage. This idea was accepted by the march, but it nevertheless earned me the undying enmity of the Spanish women marchistas when I enforced their wait in line during one of my stints as a monitor. This protocol, however, did prevent further plumbing problems. I was of course unrepentant. Nicaragua had far more serious issues to deal with than unplugging sewer pipes clogged by well-meaning, but sometimes thoughtless, do-gooders. Today's solidarity circle has special meaning. We cannot stay another night at the customs warehouse, but our situation is precarious. Costa Rica Libre members are close by, threatening to assault us if we cross the border. Viva La Paz shows one of these lovers of freedom and democracy wearing the skull-adorned T-shirt so popular with U.S. right-wingers: Kill 'em all, let God sort 'em out. (This colorful phrase almost certainly traces its linealogy to an order given by Arnaud-Amalric, the Papal Legate in charge of Pope Innocent III's armies in 1209. As they attacked the city of Beziers, Arnaud-Amalric's officers asked how they were to distinguish between those still faithful to the Holy Church and those who had strayed into the path of wickedness. "Kill them all," he said. "God will recognize His own." —Harper's Magazine, May 2005, p.8.) When the wearer of the t-shirt saw that he was being filmed, he raised a "patriotic" banner to cover it. A man with the courage of his convictions. In any case, for a good part of the day, we have no assurance that there will be transportation at all. Our Costa Rican bus company has reneged on its promise to take us to San José. 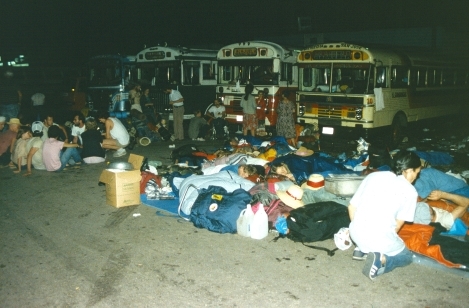 Then, as if by magic, buses appear, and we are told that we will have 12 hours to pass through Costa Rica, without stopping. The national groups meet to discuss how to meet this challenge. 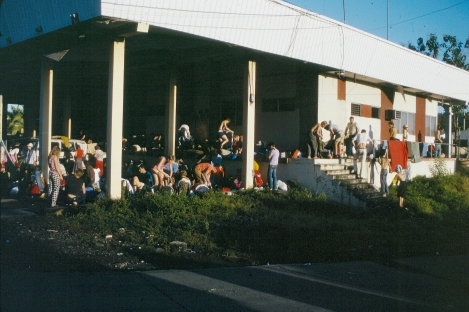 Contrary to my earlier tongue-in-cheek quip about our unanimous accession to government directives, the Canadians decide to stay on the loading docks and try to walk throught the border the next day, as a protest against right-wing intimidation. They are ready to die for the principles the march stands for. Finally, in a drenching downpour, we board the buses and leave the Canadians behind. We travel 400 yards to the border, and stop. The border has been closed to us until morning. We will have to spend another uncertain night here. We sleep in the buses. Here, Mel Fiske nurtures the bug that will ultimately send him home. And we sleep on the street. Later, the Canadians rejoin us. "People slept better," noted Mel. A typical palaver, and our last before leaving Panama. 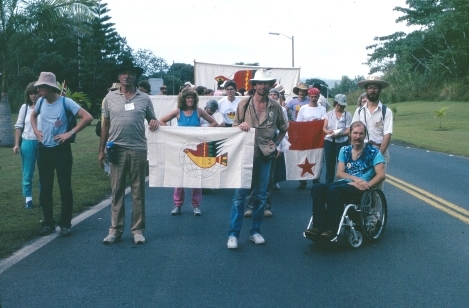 Richard, from Wisconsin (red & white baseball cap), and Steven became my regular companions as the march progressed. Richard was a teacher, as I recall. I was deeply saddened to learn that he, too, died not long after we returned to the U.S. The Canadians again show great spirit and solidarity in their readiness to face violence. I'm in serious tears listening to them. It appears that we will never leave Panama. Finally, we get the word that Blase has persuaded Benjamin Piza to allow us into Costa Rica. To the buses. Peter Holding seems undecided on which bus to board. We will be escorted to San José by the Costa Rican National Guard. As we board the buses, a guardsman checks our passports one-by-one, carefully matching the photo with the face. Once on the bus, no getting off. Each bus also carries three guardsmen with Uzi automatic rifles. We wait. It's hot. Finally, we cross the border at 11:45 a.m., December 15. A short ride, and we stop again. We're soon joined by four truckloads of guardsmen, two trucks in front, two in back. At noon, we move out. Next stop, San José, Costa Rica.